Manchester United have drawn 2-2 at home to Arsenal in a barnstormer of a game. The away side took the lead through a header from Mustafi, but Martial was able to equalizer soon after. Arsenal took the lead a second time after a flukey Lacazette goal, but United tied it back up nearly seconds later after Lingard poked it home from close range. Mourinho made a number of bold decisions in his starting lineup for this game. The big news came in the dropping of Paul Pogba, who had to settle for a spot on the bench after a poor performance against Palace. Lukaku was relegated to the bench as well, as Marcus Rashford got the nod in the striker position. Bailly and Rojo made their returns to the team, and formed a back three with Smalling in defense. United started the game on the front foot thanks to a high pressing game. It was interesting to see that tactic employed by Mourinho, but it helped rustle Arsenal early on. The home side tried to take arcade of the bright start, and had a decent chance created when Rashford found space on the edge of the area. He hit it hard and true, but also hit it right at Leno, who had no issues dealing with the effort. Another half chance fell to the home side, when Martial found himself in a similar position. He went for a left footed shot, but couldn’t make a solid connection with the ball and it peerolled to Leno. The high press calmed down, and Arsenal got more into the game. Iwobi got by Bailly down the wing, but the Ivorian recovered well to block the cross out for a corner. It was quickly whipped in, but immediately headed away by Darmian. There was a prolonged spell of possession for Arsenal. Some clever build up play created space for Kolasinac to get down the wing. The low cross wasn’t properly cleared, but Bellerin sliced a shot wide to end the move. The away side would take the lead off a set piece soon after, however. Mustafi got open in the area, and headed it down onto the ground. It was hit right at De Gea, but the goalkeeper lost control of the ball. It bounced behind him, and it seemed like the day was saved by Herrera, who cleared it away. The ref gave the goal after consulting goal line technology, which showed the ball had clearly crossed the line. It was an immediate response from United, who grabbed a crucial equalizer moments after. A free kick from Rojo forced a decent save from Leno. The ball somehow stayed in, and Herrera was the first to react, immediately rolling it across the area. It eventually fell to Martial, who slammed it home to make it 1-1. Some quality direct play from Rashford down the wing won a free kick in a good position for United. He cut inside before being hacked down by Mustafi, who was deservedly booked. A clever routine created a quality shooting chance for Rojo on the edge of the area. It was blocked, and Arsenal managed to clear it away soon after. The game really started to heat up, as both clubs picked up a number of yellow cards in quick succession. It felt like the United vs Arsenal games of old, which was brilliant to see. The first half came to a close with neither team too happy to be level at the interval. Martial was somewhat put through on goal by Lingard, but the Arsenal defense did well to track back as a unit to shut down any space. The ball bounced around, but was eventually cleared away. Some quality build up play from United carved space into the Arsenal defense. The move culminated in Rojo picking up the ball on the edge of the area, and ripping a shot that had to be tipped over the bar by Leno. The game grew into life, and Arsenal thought they had a chance when Kolasinac was played down the wing. His low cross was aimed at Aubameyang, but Rojo was able to clear away the danger. Martial seemed to pick up a knock, and had to come out, with Lukaku replacing him on the pitch. It would be another shocking goal conceded by United to give the away side the lead. It was all due to the incompetence of Rojo, who gave the ball away under no pressure. He ran back to try and repent for his errors, but ended up tackling the ball of Lacazette into the net. Somehow, United immediately equalized seconds later. An aimless long ball was lumped in behind by United. Some miscommunication from Arsenal lead to the ball sitting still in the area. 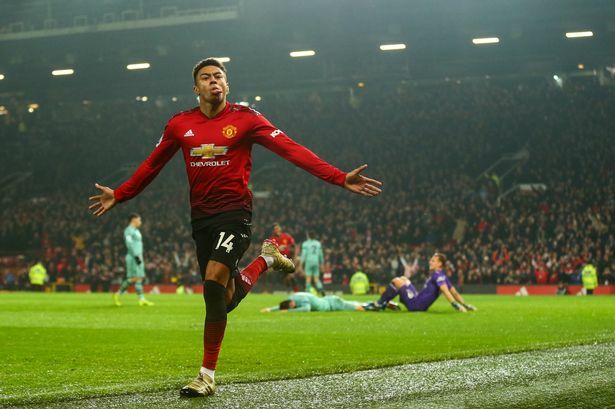 Lingard reacted first, and ran through to tap it in from close range. David De Gea would make up for his precious error before the game was done. It was a massive save, as a low cross picked out Aubameyang a few feet from goal. He took his shot first time, but De Gea reacted quickly to make a kick save and keep the score line level. It would be another superb save soon after. Aubameyang went for the curler, and it had eyes for the corner, but De Gea got his hand up in time to hit it away. United almost grabbed a freak goal themselves when a long shot from Rashford was spilled by Leno. Luckily for him, the keeper collected in the ball in time before it crossed the line. Arsenal thought they grabbed a remarkable late winner. The initial shot from an Arsenal player was saved, but the rebound fell to Mkhitaryan. He smashed it home from a right angle, but it was correctly called back for offside. The game finally came to a hectic close, which neither time too happy with the draw, but both willing to take a point on the day. Manchester United’s next game is on Saturday, as the Red Devils host Fulham at Old Trafford.